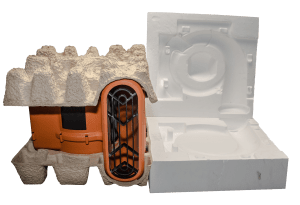 Molded Fiber Friendly to the Environment - Henry Molded Products Inc.
As companies are becoming more focused on the environment, they are choosing better alternatives to foam and plastic for their packaging needs. Molded fiber is a perfect cost-effective sollution. Our molded pulp fiber is made from 100% recycled materials and can be reused, repurposed, and is biodegradable. We even reuse the water that goes into making our pulp slurries. Why is the switch to molded fiber so crucial? Plastic and styrofoam are harmful to animals and the environment. According to EarthDay.org, 8 Million metric tons of plastic ends up in the ocean every year. 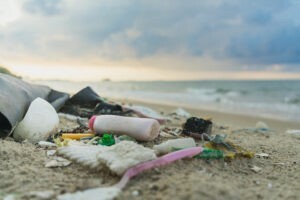 Plastic Oceans states that the packaging industry is the “. . . largest end use marketing segment accounting for just over 40% of total plastic usage.” As a leader in the packaging industry, we hold ourselves to high-standards. For over 50 years we have been eco-friendly and will continue to manufacture recycled and biodegradable molded fiber products. Molded pulp fiber is the best option for packaging because the pieces are nestable, the product is durable, and the possibilities for design are endless. We also manufacture items using a special pulp slurry with non-toxic natural wax binders for water hold-out properties. Below is an example of a customer who switched to molded fiber. They were previously using foam. We were able to manufacture a sturdy, eco-friendly, and cost-effective protective packaging product. Floor dryer in molded fiber packaging shown on the left. Prevous foam packaging on the right. For more facts about pollution from non-biodegradable products, click here. Choose molded fiber. Choose Henry Molded Products. Contact us today and make the switch to molded fiber.